Like its more understated mother, this beautiful watch is a work of art. 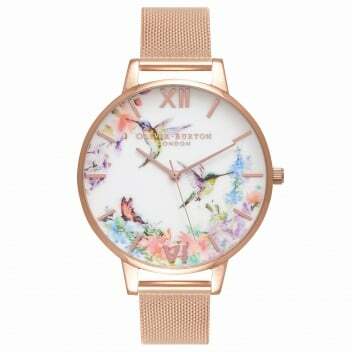 It features the same hand painted painterly prints hummingbird motif on the dial in the same ice cream shades of pastel. The dial is a little bigger, at 38mm. The strap is created in rose gold mesh, adding a touch of vintage chic to the watch. The watch is anything but old fashioned though, and would look great stacked with bright bracelets for anyone in love with this season’s more is more trend.